Above: In Hebrew “Yahweh” is read from right to left. You’re going to love what the letters spell out! Believers today pretty much take for granted living their lives with access to their Bible to study and learn God’s Word. But for most of the world’s history, that was not the case! Since the invention of the printing press in the 15th century, the Word of God can be read regularly not only by Church leaders, but also by regular common folk. But for the first 3000 years of God’s recorded Word, access to God’s inspired Word came only from hearing pieces of it read on Shabbat. Rarely did non-Levites have a personally owned scroll to read in their spare time. Back in the Old Testament days, God’s inspired Word that was given to Moses and the prophets was painstakingly copied and recopied on animal skins. It took a whole year for one person to copy the first five books, Genesis to Deuteronomy, called the Pentateuch. So usually the only way you could learn scripture was attending Saturday Shabbat, when the Jewish leaders would read a predetermined portion of the Pentateuch, mandatorily completing the entire Pentateuch in one year before beginning it over again. Other scriptures from books like Daniel, Psalms, or Ruth were also read to supplement that week’s teaching. To remember to do and not do all that you heard was an obvious problem. There are 613 laws in those first five books—248 are “to do” and 365 are “to not do.” That’s a lot to learn if you’re only hearing them in pieces on Saturdays! Therefore, in the 15th chapter of the Book of Numbers, the Lord dealt with this tremendous responsibility. It begins with the Lord laying down several requirements about keeping the Law and the penalty of death if someone defiantly breaks the Law. But the Lord also made a provision for dealing with people who unintentionally break the Law without realizing they did. Moses then records the story of a man who was caught gathering wood/working on the Sabbath. Exodus 31:14-15 clearly states no work shall be done on Shabbat and the penalty was death if you did. The Lord told the congregation, through Moses, to stone the man to death for breaking the Law, which they did. He apparently had willfully broken the Law—he knew it was wrong—so no exception could be made for not realizing what he had done. So as Jews learned the Law on Saturdays in their synagogues, they were held responsible for their future actions if they knowingly broke the Law—many of which had a death penalty associated with breaking it. 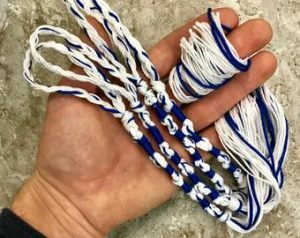 To help keep the Israelites from forgetting that they were under the Law and to remind them of the penalty for breaking the Law, God commanded them to hang blue tassels on their garments. This is usually done today by hanging blue tassels on the corners of their robes and/or prayer shawls. Today, when a Jew wears his tassels (often referred to as tzitzits) on the four corners of his prayer shawl, he ties them in such a way that the knots spell out “Yahweh,” the name of God. Naturally, not all Jews agree. Some Jews disagree with the 10-5-6-5 numbers and rather tie their knots in a 7-8-11-13 sequence. But the point is, they all tie their tassel knots in a way that reminds them to obey Yahweh. What’s really fascinating is what the letters in the name Yahweh actually mean. 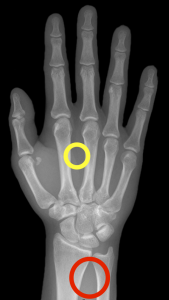 Yod means “hand,” specifically from the wrist to the tips of the fingers. Vey signifies a nail, peg, or hook. It even looks like a nail. So today, the Jews who so meticulously and piously tie their tassels so they can read the name Yahweh are looking directly at their true salvation—Jesus’ blood from the nailed wrists as the propitiation for their sins. When God said He would blind the Jews, He meant what He said! Only a few Jews become Believers in the Church Age. And most of those who do struggle with getting away from the Law. They tend to want to work Jesus into the Law instead of making Jesus’ and Paul’s instructions their life’s focus. 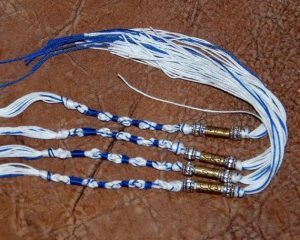 But getting back to God’s instructions to the Israelites to tie those tassels to remember His Commandments, we can certainly apply it to us living in the Church Age. What is it that we need to do to remember God’s Word on a moment-by-moment basis? To armor up, we’re to know the Word of God. Now, more than ever, we need to know God’s Word to discern good and evil. Satan is a liar, and the Word sheds light to discern truth from lies.